Greetings. In May 2011 I successfully defended my Ph.D. dissertation, titled "Machine Learning and the Quantitative Analaysis of Confocal Microscopy with an Application to the Embryogenesis of Drosophila melanogaster". My advisor was Yoav Freund. My research is in the application of machine learning techniques to build adaptive systems that learn though on–going expert interaction and training. A key theme of my work is to make these approaches usable by non–experts in machine learning. My dissertation focused on the automated quantification of nascent and cytoplasmic mRNA transcripts from fluorescent confocal microscopy and was done in collaboration with the Labs of William McGinnis and Ethan Bier in the Department of Developmental Biology at UCSD. I recieved my Ph.D. in Computer Science from University of California, San Diego in 2011 and my M.Sc. in Computer Science from Columbia University in the City of New York in 2005 after working for over 15 years in software development and engineering, management, product development, and consulting for a variety of industries. My B.Sc. 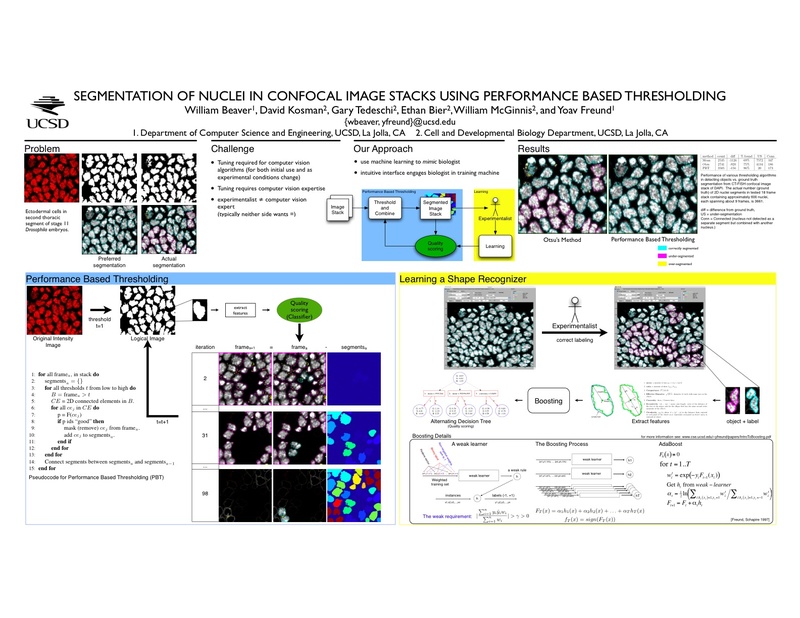 is in Information and Decision Systems with an additional major in Political Science from Carnegie Mellon University in Pittsburgh, Pa.
We translate multi-channel image stacks into per-cell quantitative measurements though a method where the experimentalist teaches the computer how to segment individual nuclei and how to identify gene transcription sites inside individual nuclei. By collocating transcription within nuclei, we construct a spatially oriented, relational model of nascent gene transcription. This method allows us to study stochastic variation in transcriptional activation in different nuclei in a developing tissue, and relating the levels of nascent transcription to the levels of cytoplasmic mRNA on a cell by cell basis. This work is done in collaboration with the McGinnis and Bier Labs in the Department of Developmental Biology here at UCSD. To study the mechanical processes underlying cell movement, time lapse movies of cells are made using a variety of staining and imaging methods to measure the local concentration of different proteins as a function of time and space. Per usual, the process of extracting numerical information from these movies is mostly manual and labor intensive. Rather than manually programming the details of the cognitive process involved in the human analysis of the movie, we use Machine Learning methods to adjust the parameters of the analysis software from examples generated by the biologist from the actual movies. This analysis is based on extracting Kymographs from synchronized DIC and GFP movies, manually labeling them, and producing filters to recognize the wave summit over time. This work was done in collaboration with Gregory Giannone, Benjamin J. Dubin-Thaler, Yoav Freund, and Michael Sheetz. Worked in collaboration with a local company that manufactures and installs remote vehicle recorders to identify and to reduce high-cost errors (Type I and Type II) in both real-time vehicle recorder processing and in the downstream human review processes of event data. The recorders generate multi-modal signals (video, audio, and accelerometer). We identified the numerous source of these errors and prototyped solutions that use discriminative techniques to address: object recognition from compressed VGA video signals, signal detectors to recognize driven vehicle dynamics, classifiers for recognition of high level driving behaviors, and designed active learning processes to drive on-going system improvement (i.e. designed the system to learn from its mistakes). We predict the transcriptional behavior of S. cerevisiae genes upon DNA damage ( up-- or down--regulation of genes in new or held--out experiments) using Boosting with alternating decision trees (ADT). we were able to accurately predict the expression value of genes in held--out experiments. The biological relevance of the ADT nodes is strongly supported by the fact that genes whose role in DNA damage response is already well established were the top regulators in our ADT, while "irrelevant" regulators did not feature prominently. In addition, we performed an "in silico knockout" experiment that revealed an interesting, well documented, interdependency between the regulators RAD53 and CLN2. This work was done in collaboration with Gabor Halasz, Mihir Shah, and Sowmya Viswanath. We argue that many mobile applications could benefit from having more fine-grained awareness of user-to-device orientation than is possible with traditional landscape and portrait modes. In contrast to approaches that measure absolute orientation of a device in world coordinates, we argue for the need to measure "workplane orientation": the angle of rotation, relative to the user, around the axis perpendicular to the user's work surface. 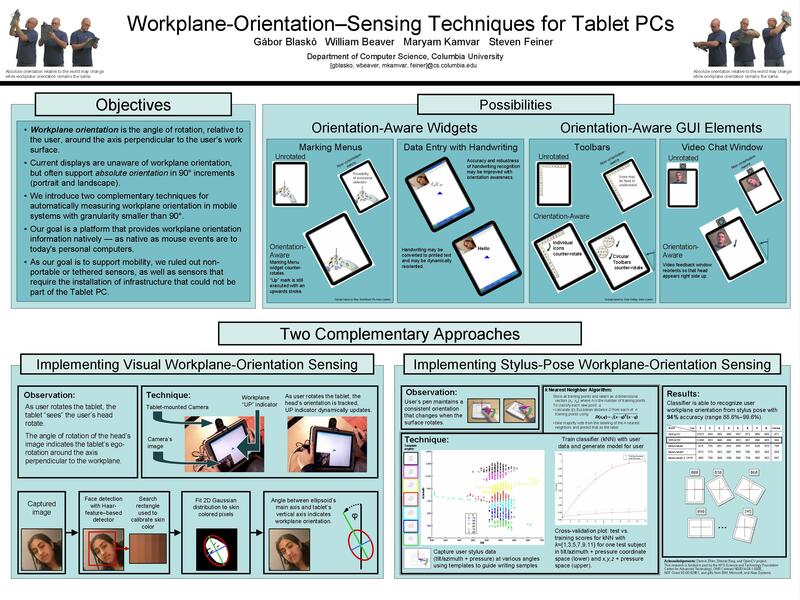 We presented a novel method to determine workplane orientation for a hand-held writing surface based on stylus pose and show how workplane orientation can be determined reliably with a granularity of better than 15 degrees using stylus data. Simulation of complex phenomena in Computational Fluid Dynamics (CFD) generates large, and ever increasing, quantities of numeric data that---even with the exponential growth in computation capability---outpaces capability to process it. This makes post-processing of simulations data and computationally expensive. We identify structures of interest (features) directly from raw simulation data, without the need for post processing. Implementations (in Java) of Cover's Universal Portfolios (Cover 1991) as tools for being competitive with the best constant rebalanced portfolio with hindsight. Included variations of Universal Portfolios with side information (Cover & Ordentlich 1996) and Universal Portfolios with transaction costs (Blum & Kalai 1997). Included sampling methods of both (Blum & Kalai 1996) and (Kalai & Vempala 2002). This work was done in collaboration with Germán Creamer and Matt Johnson. Current Biology 19, December 15, 2009, Pages 2037-2042. 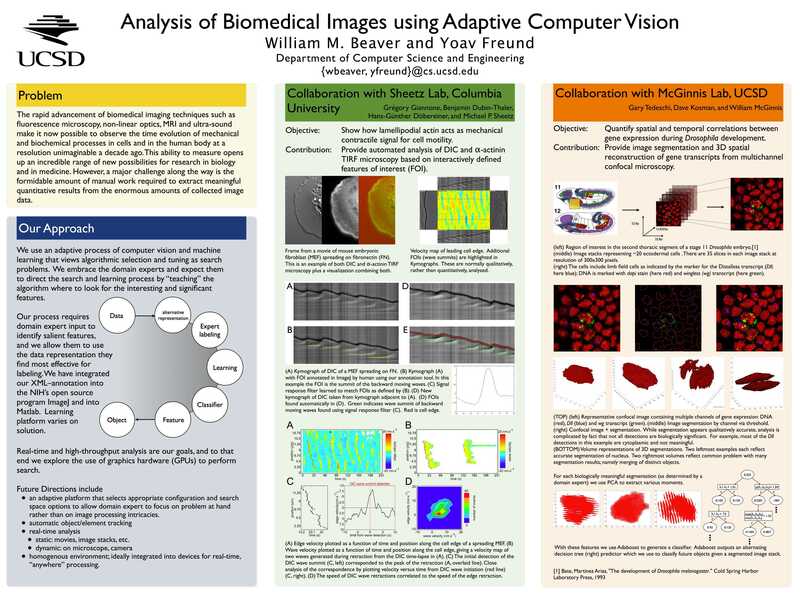 Proceedings of 2007 IEEE International Symposium on Biomedical Imaging (ISBI), Washington, DC. April 11-15. Cell, Volume 128, Issue 3, 9 February 2007, Pages 561-575. Adaptive image segmentation methods applied to the analysis of Snail repressor dosage impact on nascent vnd, sog, rho and brk transcription. 49th Annual Drosophila Research Conference, San Diego, CA. April 2-6, 2008. William Beaver, Adam Pare, David Kosman, Ethan Bier, William McGinnis, Yoav Freund. 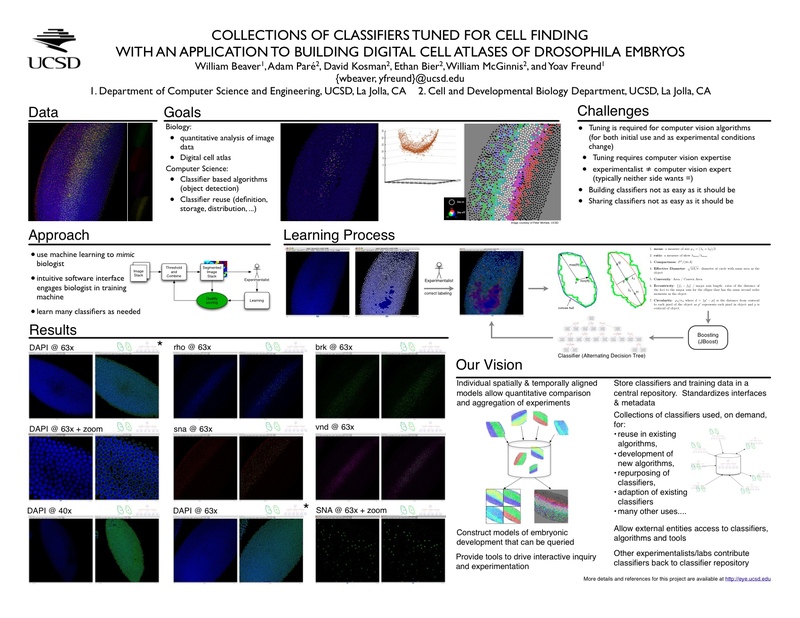 Collections of classifiers tuned for cell finding with an application to building digital cell atlases of Drosophila embryos. Bio-Image Informatics Workshop, University of California, Santa Barbara. January 17-18, 2008. FISH based method for automated quantification of nascent and cytoplasmic mRNA transcript numbers in fixed Drosophila embryonic cells. 48th annual Drosophila research conference, Philadelphia, April 2007. Automated Image analysis of Multiple Gene activity patterns in developing animals. Platform talk at the 48th annual Drosophila research conference, Philadelphia, April 2007.